THA offers both rut elk rifle and late season elk rifle hunts. The rut hunts are in the rugged Alberta foothills NW of Calgary from Caroline to near Rocky Mountain House, areas that contain excellent elk terrain and habitat. We offer our late season elk rifle hunts South of Calgary in the Porcupine Hills. During the rifle rut hunts, we will be cow-calling and/or bugling to try to bring the bulls in to our hunters. We are very flexible in the methods we use to attract the bull elk. If one method isn't working, we will change the plan and/or location as required. On these hunts, we provide each hunter with complimentary wolf and coyote hunting. There are excellent wolves in these areas. Opportunity rates for elk during rifle season can range from 0% to about 50%. Trophy Hunters Alberta offers the majority of our elk rifle rut hunts in the rugged Alberta foothills northwest of Calgary, near Rocky Mountain House. These zones offer good habitat and terrain for elk. Rocky Mountain House is about 3 hours north and west of Calgary, just east of the mountain zones leading into the massive Canadian National Parks. These are large zones of several hundred square kilometers each. One of the accommodations for our elk rifle rut hunts is the 'Grandview Stage', a rustic remote full facility lodge, which we use if we plan to hunt our northern Elk area in WMU 330. When hunting Elk in WMU 326, we typically stay at the 'Tay River Motel', a local motel with a communal entertainment area in close proximity to the hunting area. Our typical tent camp is a semi full-facility remote camp utilizing large outfitter tents, frequently interconnected. The guides and cook are located in their own tent, giving hunters privacy and lots of room. There is typically a central area for cooking and eating. Each tent has its own wood stove. We also utilize other local motels when practical. 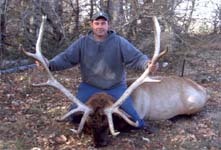 Trophy Hunters Alberta offers big game elk rifle late season in SW Alberta. 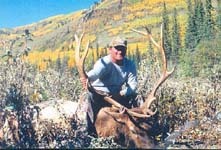 Hunt elk from October 25 (opening day of the rifle elk season) through to November 30. These hunts are in the SW Alberta foothills with accommodations at various working ranches. This hunt is for world class mule deer as the primary species, with opportunity for elk, especially during the opening week of the season. The rifle season for Elk opens later in these late season zones, and though no longer in rut, the herds with their cows and bulls are quite mobile. The SW Alberta area harbors many serious mule deer which are the primary focus of the hunt. Our SW Alberta mule deer hunts always provide 100% opportunity for a 140+ class muley, with our normal average mule deer being in the 160 class range. These are excellent combination hunts for a sure fire mule deer and hopefully a chance at a nice elk. THA's combination mule deer/ elk hunts take place in the agricultural rural foothills regions SW of Calgary with terrain ranging across open fields, creek and drainage beds, short brush and majestic rolling foothills. There is rural road access in the area, as most of the land is privately owned by farmers and ranchers, with some crown land also in the vicinity. These hunts can be very productive, but there can also be lots of pressure as these elk have not been hunted for almost eleven months. These are popular hunts, with limited availability, that require early planning and booking.